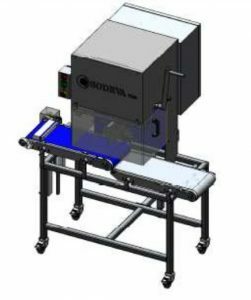 SODEVA is specialized in cutting machines for cheeses dairies , confectioneries, frozen food, cooked meat, cakes slabs or tarts. Also screening machines are supplied in liquid-phase for dairies or pharmacy, cosmetics industries. We supply US and Canadian market with our Canadian subsidiary based in Quebec. Manufacturer of all his cutting vibrating blades or seiving devices with ultrasounds. Our customers elaborate their processes from their industrial sizes to the end customers portions in line directly to their sales in retail portions in the packaging. Contact us to know our new devices ! – New vibrating blade high velocity to cut frozen 600 x 400 mm slabs minus 18°C ! 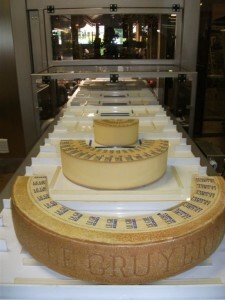 – Cheese fixed weight machines for round cheeses and square all portions in line to your packaging. 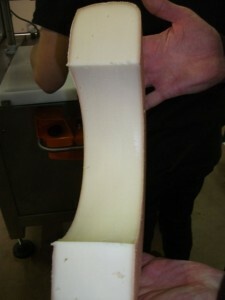 – Brie extracting portions at fixed weight 70 portions minute direct to the packaging machine in line ! 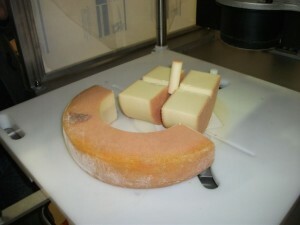 Our new models of slicers dedicated to small cheese dairies cutting both loaves and wheels are available ! The frequency emitted by our ultrasonic slicer generator provides a very efficient slicing by a vigrating blade or sieving by a vibrating screen.Without this vibration you cannot easily and cleanly cut very fine and complex food or sieve powders from 20 microns. 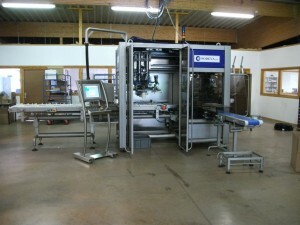 Fixed weight for pre-packed, for important savings throught an accurate control of the sold product. 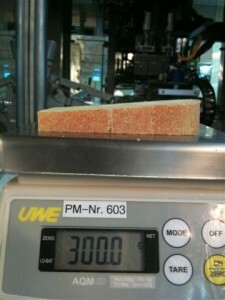 Exact fixed weight 300 g ! Spare blades sale at best price. Our technical service will pass our know-how to you. Ultrasonc sieving by a soft and efficient unclogging, respectfull to the product’s quality, for any kind of powders from 20 micron screens, and effective serum separators for high volume cheese (80 m3 / h). Screens mounting on empty frames for any kind of mesh or fabric types, according to the requiredstandards, providing year contracts with safety stock, we work in 2×8 hours shifts to ensure quick delivery. Our new slicers are able to cut all shapes with the same machine, loaves, logs and wheels a versatile machine with high speed. 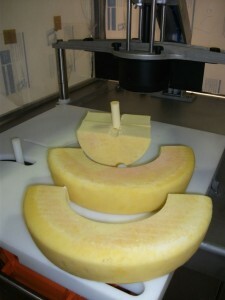 We have a wide in stocks range of slicers, sievers and cleaning stations. Our rental package or test with buying option has attracted many customers by its simplicity and transparency, try it!